Trusted and renowned newspaper, ‘Times of India’ was looking for a quick turnaround time with regard to some of their creative concepts. TOI wanted to design a captivating new campaign over an extended period of time, covering different occasions of relevant significance, and they needed an agency that could deliver quick adaptations within the stipulated timeframe. 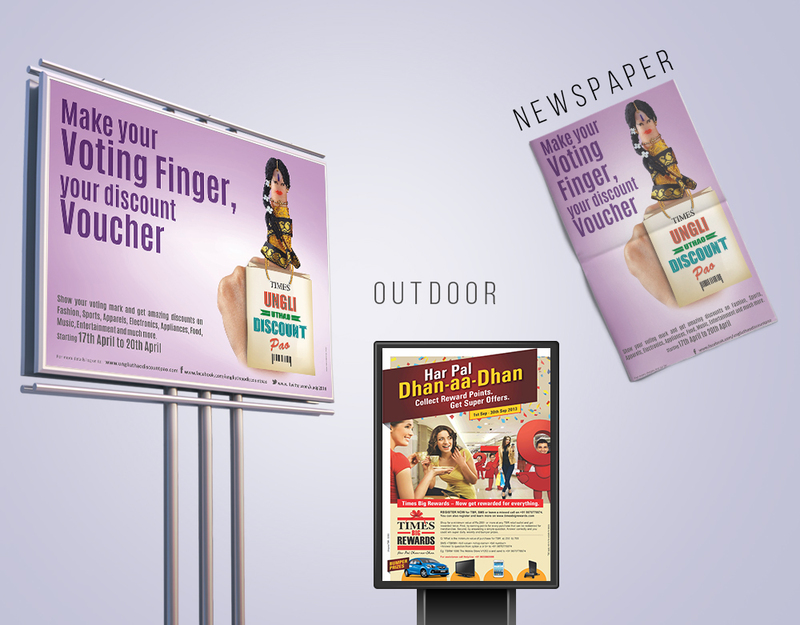 Already having worked on a spectrum of campaigns, our experienced team had the capability and flexibility to deliver quick adaptations during the busy election season, when TOI was in full swing with the “Ungli Uthao, Discount Pao” campaign, which proved to be a hit! We also nailed quick delivery for executables during the “Har Pal Dhan-aa-Dhan” campaign. Our considerable efforts have helped TOI navigate extremely busy periods quite seamlessly. We have a continual, symbiotic relationship with TOI thanks to the successful collaterals we have delivered over time. To this day, we continue working with the ‘Times of India’ and enjoy a successful working relationship.